Lossless MP3 Cutter Joiner 7.0.0 | Free eBooks Download - EBOOKEE! Posted on 2017-08-04, by everest555. Lossless MP3 Cutter Joiner is an easy, efficient, fast yet lossless MP3 Cutter Joiner. The exclusive characteristics of this MP3 Cutter Joiner is that it is capable of direct Joining & Cutting MP3 files without quality loss and reencoding effort. It is your wise choice for non-destructive MP3 Cutting And Joining. As a MP3 Splitter, it can also Split MP3 album file with cue sheet. MP3 Cutter Joiner - Why It? Cut MP3 files into equal-length sections. Cut MP3 files into MP3 files whose size are predefined. Cut MP3 according to the sound amplitude (pause detection). Cut MP3 sections whose start and end points are specified by user, you can play, prelisten and set the cutting range effortless. It also supports batch cutting section mode. Merge and Join MP3 files directly into one big file without quality loss. If lossless MP3 Joining is not applicable, it also can reencode to Join MP3 files. As a MP3 Splitter, it can also Split MP3 album file into tracks with cue sheet. It Splits, Joins and Cuts MP3 files directly without introducing decoding and reencoding, the sound quality of generated MP3 files is as good as the source ones. It supports parallel MP3 Cutting And Joining, you can run up to 16 tasks concurrently. It is the fastest MP3 Cutter Joiner available, 2x ~ 100x faster than its competitors. It can copy & save audio tag from the source files to the destination ones, Lossless MP3 Cutter Joiner is capable of writing ID3v1 (v1 and v1.1), ID3v2 (v2.2, v2.3 and v2.4) and APE (v1 and v2) MP3 tag. It also saves the Lyrics3 tag (v1 and v2) as well as album art (cover picture). It updates and writes the vbr headers of the destination MP3 files if possible. It is mainly designed for MP3 (MPEG-1, Layer 3), but it also works with MP1 and MP2 (MPEG-1, Layer 1, MPEG-1, Layer 2) files. It supports flexible and fully user-defined output pattern. It can create cue sheet for the merged mp3 files and generate M3U playlist for the cutted mp3 files. Lossless MP3 Cutter Joiner supports batch mode and can handle hundreds of MP3 files at once. Lossless MP3 Cutter Joiner supports on-the-fly cutting & joining, in other words, it does not generate temporary files during the cutting & joining process. 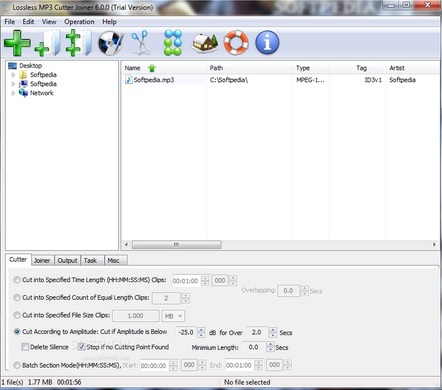 Lossless MP3 Cutter Joiner can effortlessly search, add and manage the MP3 files to be processed. It supports various post actions: Beep/Play Sound/Exit/Lock/Log Off/Stand By/Hibernate/Restart/Shutdown. No comments for "Lossless MP3 Cutter Joiner 7.0.0".